Information for patients is a core element of treatment for venous disease. Trustworthy and intensive communication between doctor and patient is the essential precondition for satisfaction and successful treatment. Only patients who have been told all about their clinical picture can muster the patience and understanding they need to cope with the medical devices and other measures required. Many studies have shown that the accuracy of the diagnosis has a decisive influence on the further course of treatment and that the patients comply closely with the doctor’s orders. You are recommended to leave out medical and Latin terms as far as possible when talking to patients, because these can lead to misunderstandings and confusion on the part of the the patient. The aim is to communicate at eye level and to provide suitable care and promote the patient’s recovery. Doctors often have the feeling that they have too little time to address the issues that concern their patients. They would appreciate support for their consultations with patients. The consultation pads 'venous system' and 'lymphatic system' save time without loss of quality. 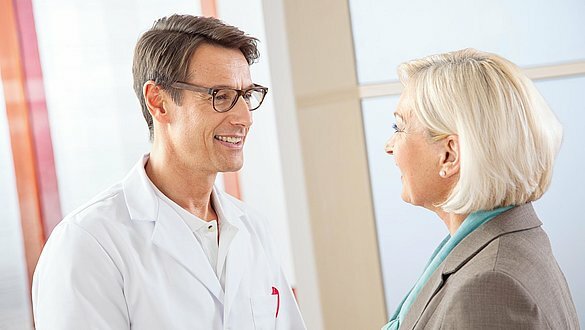 Doctors and patients thus gain additional time for a targeted dialogue. True to the saying “a picture says more than a thousand words” this pad helps to explain, by means of anatomical drawings, the diagnosis to the patient in an easily understandable way and in less time. Descriptive pictures of anatomy and mode of action of compression garments the promote patient understanding and compliance. Consultation Pad Venous System Consultation Pad Lymphoedema You can order your personal copy of the consultation pads from us free of charge using the integrated order form. Is there anything else we can do to support you? Please let us know. We’ll be pleased to arrange a personal appointment with you.